If you are looking for a way to increase the safety of your fireplace during use without interfering with the visual appeal, you may want to find a reliable provider of wrought iron fireplace doors in Los Angeles. Functional and attractive, fireplace doors can blend in or emphasize your current mantel and decor depending on the style you choose. Fireplace doors can help to keep flammable items away from the fire and prevent burning embers from getting out into your room. You can have peace of mind knowing that your fireplace doors are there to protect your property and that your loved ones have that extra level of protection from the flames. 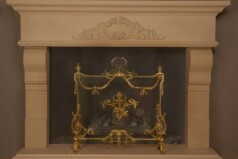 Be sure to discuss your needs with your provider of wrought iron fireplace doors in Los Angeles to choose the right size for the opening of your fireplace mantel and surround. Wrought iron provides an attractive and decorative look that goes well with any style. The beauty of wrought iron can range anywhere from minimalist to allow the design of your mantel to shine through, or more extravagant to enhance a more simple mantel. As a leading provider of wrought iron fireplace doors in Los Angeles, SoCal Fireplace Mantels is ready to help you to choose the size and style of fireplace doors that will suit your style and your budget. Wrought iron is an excellent material to use in features that will need to withstand intense heat. From rustic to more elegant styles, your wrought iron fireplace doors will maintain their beauty through years of exposure to the heat and flames that are used to keep you warm or provide an ambient atmosphere. With many styles and options to select from, it can be difficult to choose just the right fireplace doors that will work well with your mantel and the decor for your entire room. You can be sure that as a provider of wrought iron fireplace doors in Los Angeles, SoCal Fireplace Mantels will give you the attention that you deserve when making your choice.